PEAK Vasodilator 2.0 is a pre-workout multi-component that increases the nitric oxide (NO) level in the body. This product increases the physiological exercise capacity of the body, increasing the training intensity and duration. This packaging contains 600 g of powdered berry-flavoured product. Unlike other NO boosters this product does not contain the stimulants. It contains the branched chain amino acids BCAA and the plant extracts increasing the energy level. Nitric oxide is a gas hormone that widens the blood vessels and facilitates the blood flow. It increases the feeling of training "pump" and the effect of vascularisation. What is more, the improved blood flow increases the oxygen and nutrients transport to the muscles, causing the increased training opportunities. L-Citruline malate. Malate is a substrate for the oxaloacetate recovery in the Krebs cycle. It participates in the creation of energy. L-Citrulline is an amino acid that participates in the urea cycle and is synthesized in the body from the amino acid L-Ornithine. L-Citrulline supplementation increases the level of L-Arginine to a greater extent than the supplementation with L-Arginine alone. Arginine is the main substrate for NO synthesis. In addition, L-Citrulina reduces the feeling of fatigue and positively affects the post-workout anabolic hormones release. L-ornithine alpha-ketoglutarate. A combination of non-protein amino acid L-ornithine with alpha-ketoglutaric acid. Alfaketogluran is an intermediate product in the Krebs cycle, where it takes part in the energy production, it is also responsible for the nitrogen transport in the body. L-ornithine, is a substrate for the citrulline reconstitution during the course of the urea cycle, which converts the excess of toxic ammonia into harmless urea. In addition, L-ornithine Alfaketogluran improves the muscle regeneration and promotes anabolic processes. L-Arginine alpha-ketoglurate (AAKG) . Endogenous amino acid, that participate in the nitric oxide synthesis, combined with the alpha-ketoglutaric acid, ensures the high digestibility in the gastrointestinal tract. Taking AAKG causes the increase NO amount in the body, causing the capillaries relaxation and an increased blood flow, what allows less myocardium effort. It has been demonstrated that L-Arginine supplementation helps to increase the muscle mass structure, what may be associated with a noticeable increase in the level of the insulin-like growth factor-1 (IGF-1). Arginine has an anti-catabolic effect on the muscle tissue. BCAA branched amino acids (L-Leucine, L-Isoleucine, L-Valine) promote the synthesis of new muscle proteins and protect muscle tissue against catabolism. They reduce the damage caused by the strength training and the occurrence of the muscular pain. They help to improve the body's efficiency and prolong the effort duration. Beta-Alanine. A chemical compound belonging to the amino acid group. In the body it is converted into the carnosine regulating the level of hydrogen ions generated during the muscle work. Beta-Alanine increases the body's efficiency and helps to maintain the proper pH level in the muscles and prevent fatigue. Glycine. One of the endogenous amino acids, it has a positive effect on the nervous system work and regulates the glucose level in the blood. It inhibits the breakdown of the muscle tissue, improves the nutrients transport to the muscles and increases energy levels. Betanin. A compound chemically similar to glycine, it participates in the methylation process, increases the muscle oxygen use, regulates the body's water balance and raises the level of insulin-like growth factor-1 (IGF-1). Taurine. An amino acid conditioning the proper nerve conduction and maintains the focus on the training. It participates in the water regulation, electrolyte management, arterial pressure and has anti-catabolic effect. N-acetyl-L-Tyrosine (NALT). The most active in the central nervous system (CNS) form of amino acid that is the substrate for the neurotransmitter dopamine formation, maintains motivation and training focus. Acetyl L-Carnitine. A chemical compound occurring naturally in the body, it facilitates the fatty acids transport to the mitochondria where they can be oxidized. The acetylated form increases the activity of L-Carnitine in the CNS, positively influencing the psychophysical performance and increase the energy level. D-glucuronolactone. A chemical compound, natural metabolite of glucose, positively affects glycogen resynthesis. It increases the energy level, influences the course of energy processes and facilitates the unnecessary metabolic products disposal. Beetroot juice extract. A source of nitrates naturally raising the level of NO in the body, regardless of the enzyme nitric oxide synthase. The supply of nitrates affects positively the physical performance by reducing the aerobic exercise cost, what increases the working time to exhaustion and the exercise intensity. Asian ginseng extract (Panax Ginseng) and Ginger extract . Their active ingredients have a positive effect on the intellectual and physical abilities. These plants have the adaptogenic properties helping the body to survive under the stressful conditions, increasing the antioxidant enzymes activity and improving blood circulation. Vitamin C, B3, B6 and Magnesium. Components that participate indirectly in the nitric oxide and vitamin C production, additionally increasing the a nitric oxide synthase activity. B vitamins are essential for the normal nicotinamide adenine dinucleotide (NADH) transformation. NADH and its oxidized forms participate in the NO formation and transformation. Magnesium participates in the muscle contraction process and increases the body exercise capacity. 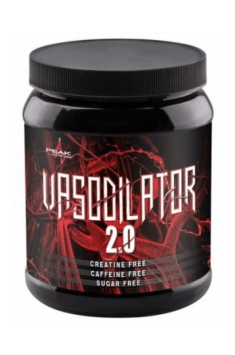 PEAK Vasodilator 2.0 is the supplement that effectively increases the nitric oxide level in the body, facilitating the transport of oxygen and increasing the working muscles energy. It contains the substances that have a positive effect on the training quality, enabling the effect of training pump and vascularisation. It is ideal for use at any time of the day, because it does not contain stimulants that can cause sleep problems. Świetny produkt. Niesamowita pompa na treningu - momentami aż do bólu- przy rekomendowanej dawce. Zwiększa także znacznie potliwość na treningu. Czuć beta alaninę. 30 grams (approximately 4 teaspoons) dissolved in 500 ml of water. Take 30 minutes before the physical activity. To achieve the maximum benefit from the supplement, it is recommended to take on an empty stomach. Consume within three months of opening. Protect against light, moisture and store at the normal temperature. Due to lack of stimulants, it can be used in the evening as it does not disturb the sleep cycle. Peak is a respected manufacturer of supplements for athletes, mainly for bodybuilders and people who do martial arts and fitness. The offer includes powerful aminoacid supplements which accelerate muscle growth, and pre-workout supplements and supplements supporting fat burning. The company also produces creatine and vitamin and mineral supplements. Other ingredients: Anti-adhesive: calcium salts of orthophosphoric acid, sweeteners: sucralose. Selective COS-2 inhibitor with an instant effect. Alleviates pain and reduces inflamation in joints. Amino acids, vitamin C and B-complex set, in the powdered form for making a fruit-flavoured drink. Tryptophan metabolite which is a precursor to serotonin – the “happiness hormone”.